In February, I traveled to Nicaragua with three other residents, two attendings, and a nurse for a 2 week global health rotation. We spent most of our time in a government health post in Mongallo, a rural community fourteen hours from Managua by bus and one hour by airplane. We also had two field clinics posted at local schools in surrounding communities. 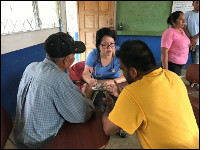 All together, our team saw a total of 647 Nicaraguans with conditions ranging from hypertension to iron deficiency anemia to pregnancy to diabetes. Working with the local health outpost nurse and a handful of interpreters, we were able to treat patients with hundreds of medications including ibuprofen, iron, albendazole, and prenatal vitamins.